Official Fundraiser - Help us Raise Funds for HSCFFS through Usborne Books! We are so excited to announce our very first ever fundraiser! 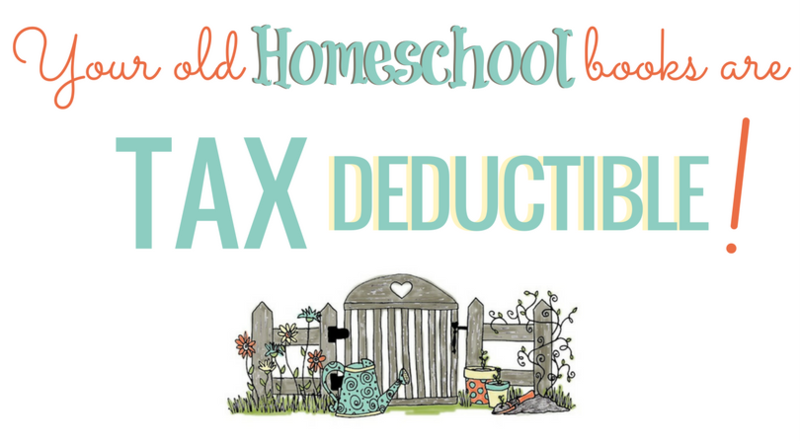 This fundraiser will be used to 1) pay the $400 we need to be able to file for charity status with the IRS (allowing us to offer tax-deductible receipts for your donations to the organization), and 2) funding completely FREE, BRAND NEW curriculum for homeschool families in need. 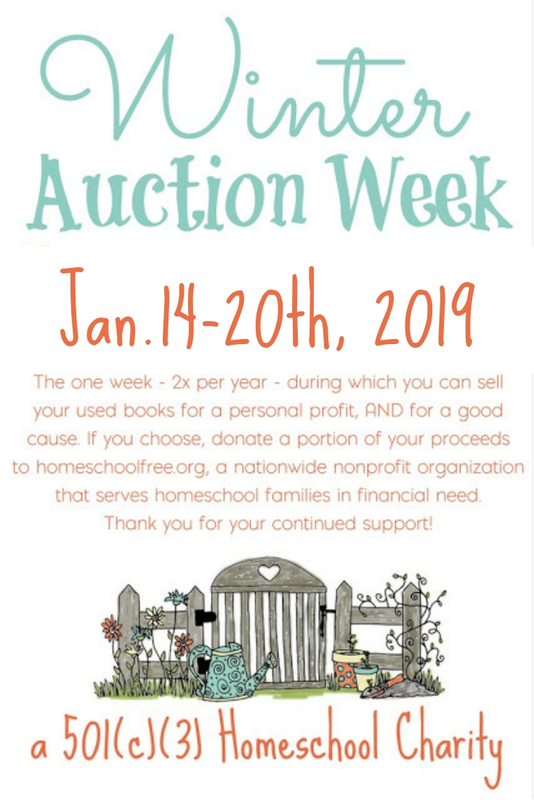 100% of the profits from this fundraiser will go to the organization, thanks to a VERY generous Usborne Rep, and local friend of the organization. All sales from Homeschool Free For Shipping Fundraiser from Oct. 1-15 will return 100% of the proceeds back to our fundraising efforts! 1. First, Click any of the links above. You'll reach the website for Jeanette White's Usborne Books page. She is a homeschooling mom and local friend of Deana's (the organization's founder) and has generously offered her services AND IS NOT MAKING A PROFIT FROM THIS FUNDRAISER, offering our organization 100% of profits made. Thank you, Jeanette!!! 2. 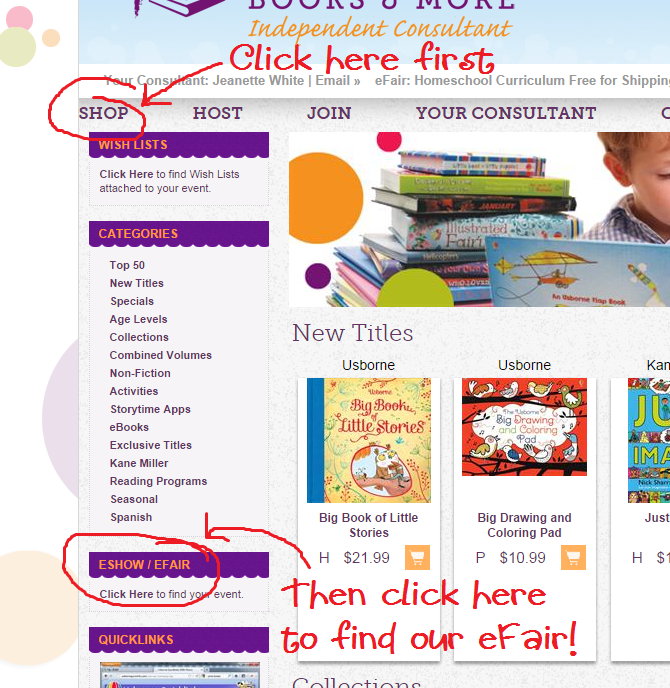 Then, click the link at the top of the page that says "SHOP"; and you'll see halfway down the bottom of the screen a link that says "ESHOW/EFAIR" - click that. Many homeschool curriculums use Usborne Books and many more families use them as fantastic supplements – from art to science, history to literature, there is something for every age! The magic of Usborne Books is that they make both reading and learning fun! What are the best ways to save and get great values from Usborne Books?? Customer Specials! For every $40 you spend, you get to choose 3 customer specials which include top sellers at up to 60% off! Internet Specials! Select books that are discounted 40-70% off! These titles change every two weeks! Combined Volumes! Multiple books combined into one binding—with the savings passed on to you! Collections! Save money when you buy a collection of books from your favorite series or author! Usborne Books are designed graphically to draw children in, to make them want to learn the material, and to help them retain that knowledge. The books are so well organized that children absorb and recall much of the vast amount of information presented. Our books cover a wide range of subjects – hobbies, history, science, nature, foreign language, and much more. Usborne Books are designed for ages birth through high school, with selected titles designed specifically for adults. For more information, or for suggestions for titles that will complement your curriculum or units of study, please contact Jeanette White, Educational Consultant at kswhite@northstate.net.